In this BSL Heart Sounds Lesson, students listen to their own heart sounds by positioning the SS30L Stethoscope* over the aortic semilunar, pulmonic semilunar, tricuspid, and mitral (bicuspid) valves. They will distinguish the volume, pitch and duration of the sound at each point and determine the point where sounds are best heard, which will be used as the recording point for the heart sounds. Students will also record Lead II ECG and compare the mechanical events (heart sounds) with the electrical events (ECG) of the cardiac cycle. To listen to human heart sounds and describe them as to loudness, pitch, and duration. To correlate heart sounds with the mechanical events of the cardiac cycle. Listen to heart sounds through a stethoscope placed on the chest over four major heart valves. Record sounds from the location where heart sounds are best described. 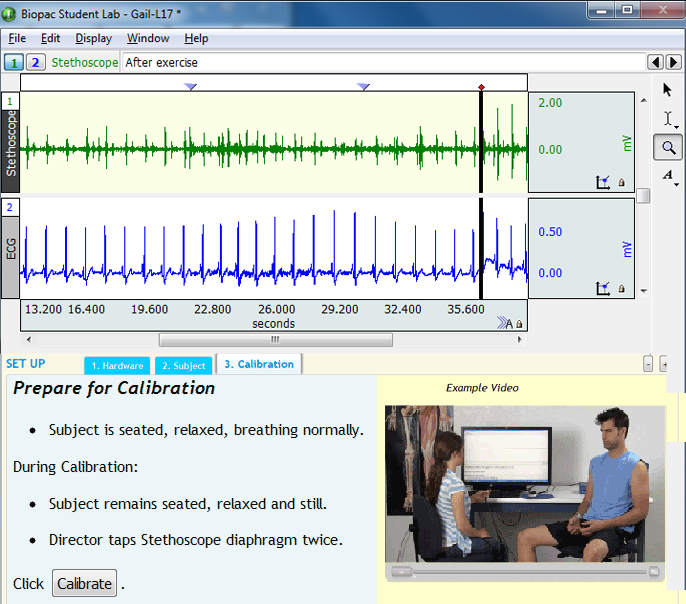 Exercise to elevate the heart rate and repeat the recording. Students see and hear heart sounds. Overlap the ECG and heart sounds signals. Highlights the difference between laminar and turbulent blood flow.